Maps.com has been providing innovative marketing solutions to small and large companies for over 15 years. Whatever the need: A co-branded atlas, locator maps, or promotional folded maps, Maps.com will provide you with a suite of options tailored to your business. Make a lasting impression with your customers and drive more traffic to your locations by way of branded, detailed maps with useful features. Available in multiple sizes and formats. Our exciting local interest maps will direct your clients to the best local attractions in your city, while also providing information about transit routes, biking trails, and more. 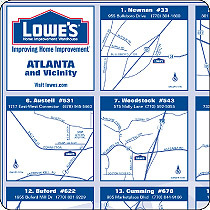 Sell advertising surrounding the maps to generate new revenue for your company. Our premium wall maps displaying your logo are great for promotional campaigns, or as a "thank you" to your clients. Whether it's a map of the world, U.S., or a specific geographic region, you can choose from a variety of sizes and styles. Private-label your very own road atlas, current events atlas, or reference atlas — these premiums will stay with your customers for years. Create a custom cover, add advertisers to the inside pages, and include company information.